Looks like someone else has beat us to the punch. Ok, I'll admit it. I've already dipped my toes into the Christmas music. I gave myself a little taste this morning while getting ready for work. Nothing crazy, but just a little jazzy Michael Buble. You may think I'm way ahead of the game, but I've got friends whose thumbs have been hovering over the play button since mid- October. Everyone has their own idea of when the holiday season begins. According to Bustle and data compiled by the Daring Kitchen, some states listen to Christmas music earlier in the year than others. Their geotagging data simply comes from the number of people who are tweeting about playing Christmas music. With more than 60,000 tweets analyzed, I'd say we have a pretty good idea of who has already jumped the holiday gun. We're looking at you, Massachusetts. 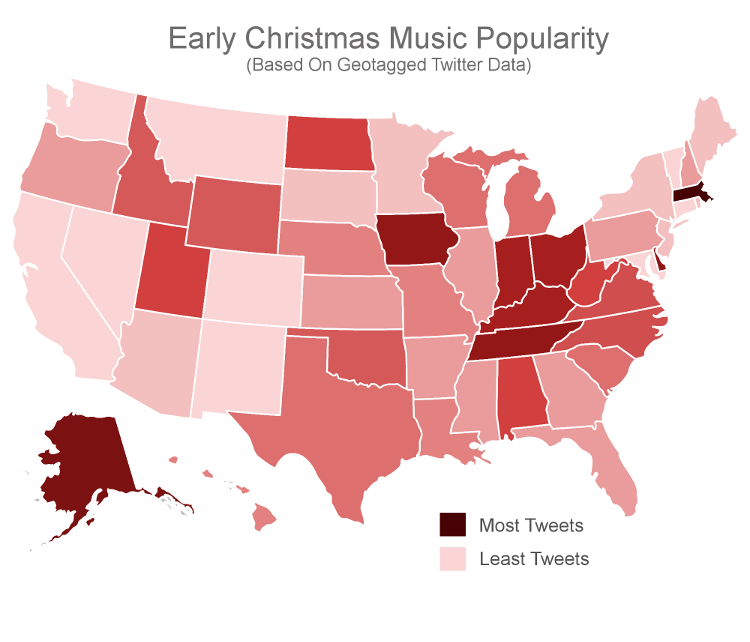 This state had the most people tweeting their love for those Christmas carols. Other states close to the top were Alaska, Tennessee, Delaware, Iowa, Ohio, Indiana and Kentucky. Judging by the colors on this map, I'd say Utah, Montana, and Alabama are pretty close to the top of the mix. Have you busted out the holiday jams yet?